​​​HOUSTON - Despite everything working in its favor—such as proximity to Metro’s red line, the George R. Brown Convention Center and a number of popular bars and restaurants—the Houston Bar Center has become an eyesore. 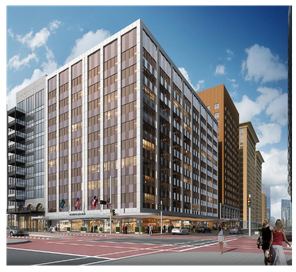 Located at 723 Main, the 102-year-old Houston Bar Center is surrounded by newer real estate such as 609 Main, a 1,050,000-sf office tower by Hines that should deliver in 2017. The JW Marriott Houston Downtown is across the street and Discovery Green is just a ten-minute walk away. Newcrest is turning the Bar Center building into a 195-room AC Hotel by Marriott. Upon its completion in 2018, Newcrest’s Marriott hotel won’t mirror the JW Marriott across the street. Instead, Maryland-based Marriott International’s AC hotels operate with a quaint, European theme in mind.